In a recent blog post, CareMore CEO Sachin Jain, MD, MBA, FACP, and his co-authors wrote that 1 in 5 Americans wants better dental care, but they lack access, often due to finances. What if you could check your blood pressure or have a nurse draw blood for a glycated hemoglobin (A1C) test while you sat in the dentist’s chair? Seniors in the Montebello, California, area will have this opportunity, thanks to a new delivery model from CareMore, a division of Anthem that provides integrated care for Medicare Advantage and Medicaid patients. CareMore launched the model this week in response to client feedback, according to CEO Sachin Jain, MD, MBA, FACP, who spoke with The American Journal of Managed CareÂ®. Maximizing the value of each encounter, or patient “touch,” is the thinking behind the new model, Jain said. As he and co-authors wrote in a Health Affairs Blog post in January,1 1 in 5 Americans say they need better dental care but lack access, often for financial reasons. The Surgeon General has endorsed integrating the services, and Federally Qualified Health Centers “have led the way,” they wrote. “For many seniors, dental care is just as important as medical care,” Jain said, but if it means scheduling multiple appointments, dental care may receive less priority. Conversely, if a senior with multiple chronic conditions, such as hypertension or diabetes, is going through a series of dental procedures, “they might see the dentist more than their physician,” Jain said. “We began to think about ways to build chronic disease management into the dental chair,” since it also involves frequent visits and titration of treatment, said Jain, who said he spoke with CareMore clients about better ways to deliver dental care during frequent informal visits. During a visit to Harvard, where Jain received his undergraduate, business, and medical degrees, the CEO found himself sitting next to the dean of the School of Dental Medicine, Bruce Donoff, MD, DMD. The dental school had been looking at the same questions of better integrating dentistry into overall medical care, and a partnership was born. Harvard will advise CareMore on training, processes, and technology, and the school will have the chance to study the model in a real-world clinical setting. A condition like diabetes can lead to tooth decay and gum problems, but the integrated model is about much more than addressing complications as they relate to dental care, Jain said. “We’re taking advantage of every single touch point,” making care more convenient for the patient and training doctors and nurses to work outside their traditional areas to provide the best care. As Jain and co-authors wrote in the Health Affairs Blog, this integrated model requires more than putting services under one roof. “Absent collaborative practice, co-location does little to break down existing silos. Improving collaboration requires upstream interventions to increase interprofessional education between oral and systemic health providers,” they wrote. Research shows that just asking patients to walk down the hall to a different office for a second service can turn into a missed opportunity, Jain said in the interview. “The minute you create additional barriers, rates of compliance and persistence go down,” he said. In the Comprehensive Care Center in Montebello, CareMore nurse practitioners will work side-by-side with dentists, identifying things like a missed colonoscopy that can be scheduled on the spot. 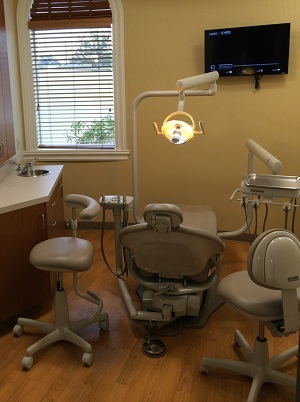 CareMore has put plenty of thought into creating a dental chair and patient room that features separate seating for the dentist and the nurse and integrates electronic health records for all care. In bringing these services together, Jain said CareMore is taking advantage of knowledge that already exists. “Dentists know a lot about chronic disease. We just don’t tap into that knowledge very much,” he said. The model could offer one more solution to the question of what the nation can do about the shortage of primary care physicians in an aging population. Instead of thinking that training more primary care doctors is the only answer, “We’re taking a broader view of who can deliver primary care,” he said. Jain will take part in the upcoming ACO and Emerging Healthcare Delivery Coalition meeting, to be held May 4-5, 2017, in Scottsdale, Arizona. He will be part of the Healthcare 2020 Series, speaking on “How Health System Are Integrating Population Health Programs.” For information and to register, click here.